The Nebraska Central Railroad Company (NCRC), is a 340-mile network composed of five former Union Pacific Railroad branch lines and one former BNSF Railway branch line. Trackage rights include rights to 70 miles of UPRR main line between North Platte, Neb. and Omaha, Neb. 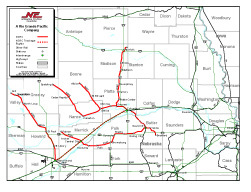 NCRC, through its connection with Union Pacific (at Columbus, Central City and Grand Island) and BNSF (at David City), is an integral part of grain shipments in the region. NCRC serves approximately 20 unit loading facilities, and annually handles more than 250 unit trains with distributed power units (DPU) and run through power (RTP) agreements, more than any other short line interchanging with the UPRR. Nebraska Central Railroad also plays a key role in the Nebraska economy by providing a variety of rail transportation services, serving a diverse group of customers engaged in industries such as steel production, agricultural products, grain marketing and ethanol production. Rio Grande Pacific Corporation maintains a 100% equity interest in this property. Union Pacific Railroad at Grand Island, Neb., Central City, Neb., and Columbus, Neb. BNSF at David City, Neb.